I came across this card (2007 Exquisite Rookie Signature Materials 12/99) on eBay last weekend, and luckily for me there was only about 7 minutes left when I did. I put in a bid for about $3.00 or so, and ended up only paying $2.25 for this awesome looking card. From the eBay scan, and even my own it looks like the signature is on card but upon in person inspection, it is a sticker- a very carefully placed one at that. You can hardly tell that it is a sticker, and I am going to make myself believe that he signed the sticker while it was on the card. Heck for $2.25 I don't care how the heck it was signed. Quad relic autograph for that price, you can not beat it. I don't really seek out his cards much these days with all the other things I am trying to track down but he does end up in my watch list often. I really look for Pujols and Cano before anyone else, and the Yankee Stadium Legacy set which has consumed my life. 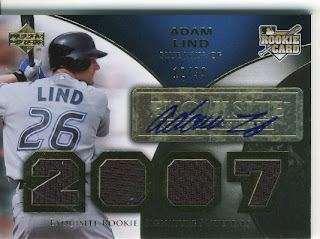 This is my first relic/auto combo of Lind and it is a serial numbered quad game used which makes me very happy. Nice snag. :) Stealth stickers are always appreciated.